Cauliflower wings are a great vegan/veggie alternative to chicken wings. 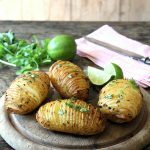 They have a crispy coating with herbs and spices and are endlessly moreish. The roasted cauliflower gets a dense, soft and, dare I say, ‘meaty’ texture. Are your cupboards stocked heavily enough to survive a zombie apocalypse for six months? Do you have a dozen tins of chopped tomatoes nestled next to countless half-bags of dried pasta? I’m ashamed to say that my cupboards are unnecessarily heaving. There’s the food waste that we see daily: the flaccid carrots that hit the compost bin, the furry yogurt lost at the back of the fridge, the stale bread in the bread bin… But what about the food in the cupboards? It’s not just fresh produce where we can reduce food waste. So, I’ve done a pantry spring clean and I’m making a commitment to stop buying non-perishables and run my cupboards down until they’re bare. Will you join me? Let’s be creative with those forgotten bags of pulses; let’s challenge ourselves to get through every tin in the cupboard before buying more. We can pull out those dry goods and use them up before they go past their use by dates. This might require a bit of kitchen creativity by the end, but that’s part of the fun. Soups and stews are a great way to use up random cupboard lurkers, or you could make hot grain salads. A helpful way to use food up is to plan meals ahead of time, based around a few mystery ingredients from the pantry. When you buy a cauliflower to make these cauliflower wings, you’ll find it wrapped in beautiful greens. Some supermarkets cut a bit of it off, but usually there’s some left intact. 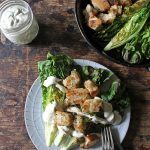 Ideally, you’ll use organic cauliflowers if you’re going to eat the greens – but I always figure that if you eat the parts normally thrown away, then organic produce isn’t more expensive than standard. Chop them up and sautee them with garlic, onions, a tin of tomatoes, a tin of chickpeas and some herbs – a great way to use up those pantry items. Cook cauliflower greens into your favourite curry (like my cauliflower leaf and sweet potato curry). Roughly cut the greens up and use them in a stew, or whiz them into a soup. Use up those old jars of dried spices in a quick side dish like these cauliflower ‘wings’. 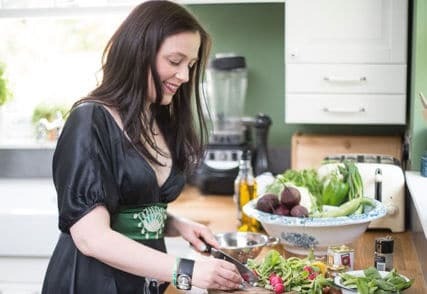 If you don’t have the ones that I’ve suggested, then dig to the back of your cupboard and see which long-forgotten herbs and spices you can add to the mixture instead. While you’re there, rotate the oldest spices to the front so they can be used up. These veggie alternatives to chicken wings have a crispy coating with herbs and spices and are endlessly moreish. The roasted cauliflower gets a dense, soft and, dare I say, ‘meaty’ texture. The shape is perfect for dipping into the cool, creamy and herby dip. You can make them ahead of time, then pop them back into a hot oven for a few minutes to warm them through and get them crispy again. If you make this, or any other recipe from my site, please tag it with #veggiedesserts on Instagram or other social media. I LOVE seeing your recreations of my recipes. Cauliflower wings are a great vegan/veggie alternative to chicken wings. They have a crispy coating with herbs and spices and are super tasty. The roasted cauliflower gets a dense, soft and, dare I say, ‘meaty’ texture. Quick, easy and tasty! Preheat the oven to 220C/425F and line 2 x baking trays with baking parchment. Cut the cauliflower into florets and set aside. Mix all remaining ingredients in a large bowl. Dip each floret into the mix and coat well. Shake off the excess and place onto a baking tray. Repeat, taking care not to overcrowd the cauliflower on the baking tray and don’t pour any excess batter over the ‘wings’. Bake for 15 minutes, then turn each floret and bake for a further 5-10 minutes or until crispy and golden. Meanwhile, make the herb dip, by mixing all ingredients together until smooth. The cauliflower wings look so yummy! I’m trying to use up the food in my pantry at the moment too as I hate food waste. 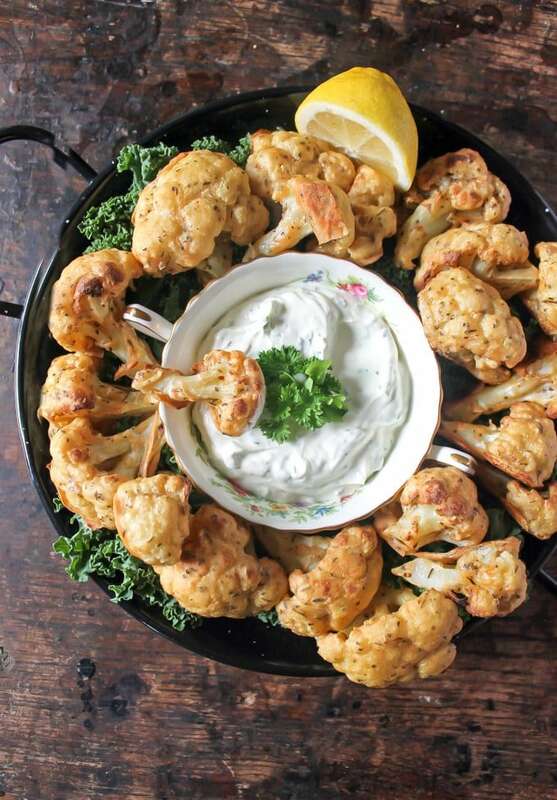 Oh wow this recipe is right up my street – I Loe veggies but have yet to do roasted cauliflower at home so going to give this a go this weekend. I’m very guilty of having a fuller than full pantry, so yes, I’ll join you! 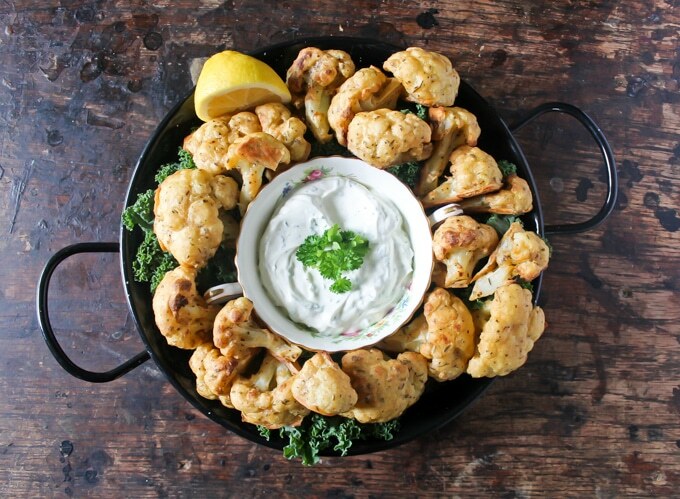 Love the look of this cauliflower recipe. Oooh delicious. Baked cauliflower is my new favourite thing. I have only tried with coconut oil and spices so I will have to give this method using flour a go. I saw cauliflower used as a veggie alternative to chicken wings once, wish I could remember where, and thought it sounded weird but they were so good they were better than the actual chicken wings. 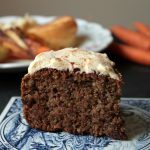 HAVE TO try your recipe, it looks even better! Me and cauliflower don’t get along and though this looks really delicious and really yummy I still need some meat or fish or eggs in the mix to enjoy. 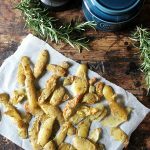 Oooh delicious and these would make a great veggie snack for entertaining friends…ideas, ideas! 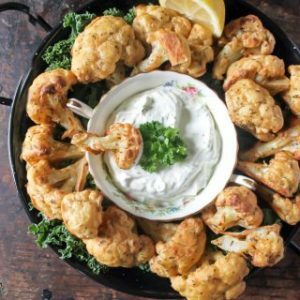 I love cauliflower, this is a great recipe for me! Mmm these look absolutely delicious! I’ll definitely have to give these a try!